True love perseveres in this Agents Irish and Whiskey spin-off novella from author Layla Reyne. 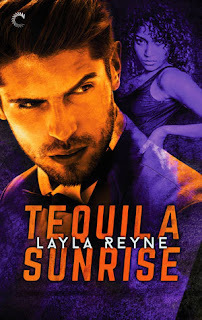 I really loved the Agents Irish and Whiskey series, so of course I was excited to read Tequila Sunrise. It really was wonderful to catch up with all of the characters again, especially Jamie and Aidan, even though they didn't have much 'together' time in this novella. I loved getting a first hand look at how Mel and Danny's relationship turned out. They made such a lovely pair, and they worked so well together. It was great seeing what a long term relationship would be like between them. The flashback scenes were a nice way to fill in the gaps in Mel and Danny's relationship, but I have to admit that they pulled me out of the current story too often. The hijacking plot brought a lot of danger and thrills to my favorite characters on Christmas Eve. I think this action packed story is a perfect addition to the series. I only wish it had been longer. I'm looking forward to reading more of this series. I particularly need some Nic and Cam action! I hadn't heard of these either but they sound really good!